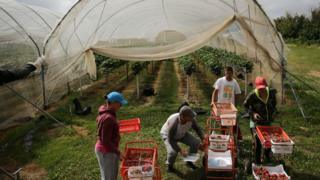 UK fruit and vegetable growers will be able to recruit non-EU migrants as seasonal workers after Brexit under a new pilot scheme. Ministers say the initiative between spring 2019 and December 2020 will help tackle labour shortages during peak production periods. The visas for up to 2,500 workers a year will last for six months. The National Farmers' Union had expressed fears staff shortages could hamper the harvesting of produce. Farms have been reporting a slowdown in EU labour since the referendum. Kuenssberg: What's the Brexiteers' alternative plan? The scheme, which would run during a transition period after the UK leaves the EU, was announced by the Home Office and the Department for Environment, Food and Rural Affairs. Ministers stressed that the pilot will be closely monitored and could close if there is evidence migrant workers were not returning to their home countries when their visas expire. The government said that more automated harvesting solutions will be used on British farms in the future. But it said the industry needed to remain competitive, and almost all OECD countries currently use seasonal workers to pick fruit and vegetables. Environment Secretary Michael Gove said the pilot's operation will be reviewed to see how best to support the longer-term needs of the farming industry. "We have listened to the powerful arguments from farmers about the need for seasonal labour to keep the horticulture industry productive and profitable," he said. Home Secretary Sajid Javid said: "This pilot will ensure farmers have access to the seasonal labour they need to remain productive and profitable during busy times of the year." Minette Batters, president of the National Farmers' Union, said growers will take great confidence in knowing that they will have access to workers next year after "extremely testing and uncertain times". She said the scheme was a "recognition from the government that British horticulture is a successful, thriving sector which faces some unique challenges but is capable of producing more great, healthy British fruit and vegetables". The UK's first seasonal agricultural workers scheme was introduced following labour shortages after World War Two. The most recent version covered workers from Romania and Bulgaria but ended five years ago when when restrictions on nationals of the two countries working in the UK stopped.